The National September 11 Memorial & Museum (9/11 Memorial) is working with the Ad Council to run a public service advertising (PSA) campaign asking citizens to “honor, remember and reunite” for the 10th anniversary of 9/11 by donating to or visiting the Memorial. The Memorial will be dedicated on September 11 and opens to the general public the following day, Sept. 12, 2011. The PSAs features 9/11 family members, 9/11 first responders, a survivor from the World Trade Center, an electrical worker on the 9/11 Memorial site, a Lower Manhattan resident, and a flight attendant. 9/11 Memorial board members Robert De Niro and Billy Crystal are also participating in the PSA campaign, conveying to viewers the message to honor, remember and reunite, and providing information on how to donate to or visit the Memorial. The 9/11 Memorial also today launched a new platform for the Memorial Guide, which displays the entire names arrangement of the Memorial. The Memorial Guide is now available as an app for iPhone through the Apple App Store on the smart phone. The app includes oral history content provided by StoryCorps, a partnership organization of the 9/11 Memorial. The Memorial Guide also reveals the layers of meaning that underlie the arrangement and displays brief biographical information about the victims, as provided by next-of-kin. The same application was previously available online at names.911memorial.org and will be available on electronic directories at the Memorial when it opens in September. Windows and Android versions of the app will also soon be available. The PSA campaign was created by the 9/11 Memorial and produced by Spark Productions. Richard Beatty is a retired member of the Port Authority Police Department and he responded to the 9/11 attack from his command station on the George Washington Bridge. He assisted in the evacuation of the North Tower and he stayed on site until it collapsed to help people to safety, sustaining injuries from the collapse in the process. Detective David Brink is a member of the New York City Police Department and was a first responder on 9/11. His partner was killed in the attacks along with other members of the NYPD. Detective Brink has generously donated a number of items to the Memorial Museum, including clothing he wore during the nine-month recovery and cleanup efforts at Ground Zero. Christopher Cannizzaro was just 10-months old when his father, Firefighter Brian Cannizzaro, was killed on 9/11. Brian was a member of the Fire Department of New York Ladder Company 101, located in Red Hook, Brooklyn. Christopher, now 10 years old, lives in Staten Island. Manuel Chea worked at a bank on the 49th floor of the North Tower and was in his office when Flight 11 struck the building. He escaped from the building shortly before the collapse of the South Tower. Mr. Chea now works at the NYC Office of Emergency Management. Billy Crystal is a member of the 9/11 Memorial’s Board of Directors. On October 20, 2001, in the wake of September 11, Billy Crystal participated in the “Concert for New York,” along with Paul McCartney, David Bowie, Billy Joel, Bon Jovi, Elton John, and Bill Clinton among many others. The concert raised over $35 million for the Robin Hood Relief fund, which helps the families of victims of the September 11 terrorist attacks. Crystal also appeared in television spots for the “Miracle of New York” public awareness campaign to help encourage tourism for New York City. Robert De Niro is a member of the 9/11 Memorial’s Board of Directors. Following the 9/11 attacks, De Niro co-founded the Tribeca Film Festival to help revitalize culture in Lower Manhattan. De Niro takes pride in the development of his production company, Tribeca Productions, and the Tribeca Film Center, which he founded with Jane Rosenthal in 1988. Through Tribeca, he develops projects on which he serves in a combination of capacities, including producer, director and actor. Anthoula Katsimatides is a member of the 9/11 Memorial’s Board of Directors. She lost her brother, John, who worked at Cantor Fitzgerald in the NorthTower. Anthoula served as the former Assistant Vice President for Family Relations at the Lower Manhattan Development Corporation, and she currently lives and works in New York as an actress. Cal Jones is the Manhattan Borough Historian Emeritus and served as Borough Historian on 9/11. Mr. Jones is a fellow at the New York Academy of History. He donated a small archive of ephemera that he collected related to 9/11 to the Memorial Museum. He was born and raised in Harlem. Lieutenant Mickey Kross is a retired member of the Fire Department of New York. Lieutenant Kross was in a stairwell in the North Tower when the building collapsed. Miraculously, this section of the stairwell protected Kross along with 15 other people, who were eventually pulled from the rubble. Kross suffered just a cut on his nose from the experience and aided in the recovery and cleanup efforts at Ground Zero. Mickey donated the fire helmet that he was wearing on 9/11 to the Memorial Museum. Juana Lomi is a paramedic at New York Downtown Hospital, located just blocks from the World Trade Center. She was one of the first paramedics to arrive on site on the morning of September 11. She continues to work at Downtown Hospital. Teresa Mathai lost her husband, Joseph Mathai, on September 11. He was at a meeting at Windows on the World, the renowned restaurant on the upper floors of the North Tower. Ms. Mathai is the Co-Chair of the Family Advisory Committee for the Massachusetts 9/11 Fund. To learn more about this organization click here. Pat Moore lives on Cedar Street in Lower Manhattan and was home when the 9/11 attacks happened just a few short blocks from her apartment. She is a member of the Community Board 1, representing the Lower Manhattan community, and has been a vital supporter of the rebuilding and rebirth of downtown community. Dennis Moran is a member of the International Brotherhood of Electrical Workers union Local 3 and is helping to build the 9/11 Memorial and Museum. His union lost six members in the 9/11 attacks at the World Trade Center. Sara Nelson is the International Vice President for the Association of Flight Attendants and works for United Airlines. Along with other United Flight Attendants Andrea Jones, Patrice Richardson, and Jennifer Workman Golden, Sara created memorial quilts from retired airline uniforms for the families of the airline professionals killed on Flight 175. They also donated a quilt to the Memorial Museum, featuring the nine names of those lost on Flight 175. Austin Vukosa lost his father, Alfred Vukosa, on 9/11. Alfred worked at Cantor Fitzgerald on the 103rd floor of the North Tower. Austin lives with his mother, Shiri, and brother, Adam. He is a junior in high school. The National September 11 Memorial & Museum is the not-for-profit corporation created to oversee the design, raise the funds, and program and operate the Memorial and Museum at the World Trade Center site. The Memorial and Museum will be located on eight of the 16 acres of the site. The Memorial will be dedicated on the 10th anniversary of the 9/11 attacks and will open to the public the following day. The Museum will open in 2012. The Memorial will remember and honor the nearly 3,000 people who died in the horrific attacks of September 11, 2001 and February 26, 1993. 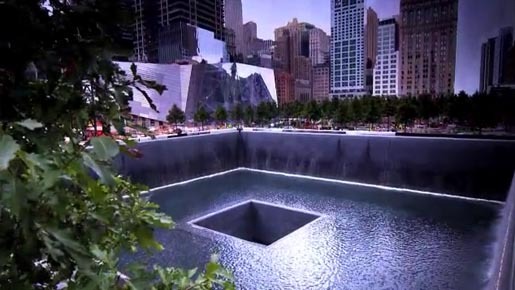 The design, created by Michael Arad and Peter Walker, consists of two pools formed in the footprints of the original Twin Towers and a plaza of trees. The Museum will display monumental artifacts linked to the events of 9/11, while presenting intimate stories of loss, compassion, reckoning and recovery that are central to telling the story of the 2001 attacks and the aftermath. It will communicate key messages that embrace both the specificity and the universal implications of the events of 9/11; document the impact of those events on individual lives, as well as on local, national, and international communities; and explore the continuing significance of these events for our global community.